JAKARTA, Indonesia – A Lion Air passenger plane that took off Monday from Jakarta crashed into the sea shortly after takeoff with 189 people on board, all of whom are feared dead in Indonesia’s worst air disaster in recent years. 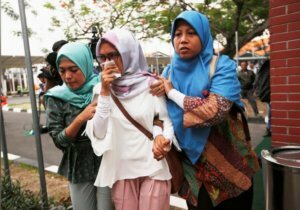 The aircraft’s pilot had asked to return to Jakarta’s airport shortly after takeoff, a request cleared by air traffic controllers. The plane then lost contact with controllers and plunged into the sea from 3,000 feet. Authorities quickly launched a search-and-rescue mission but later said they expected to find no survivors. Rescuers soon began pulling debris out of the sea, including parts of the aircraft’s fuselage, ID cards and bags belonging to the passengers. Body parts were slowly being recovered as well. People at an offshore refining facility nearby also found remnants of the aircraft, including plane seats, in the water. Officials said they have received no confirmation that anyone survived. “My prediction is that no one has survived, because none of the victims have been found” intact and alive, said Bambang Suryo Aji, the national search and rescue agency’s director of operations. Nine body bags have been taken to the hospital, filled with parts of the victims’ bodies. Fifteen ships are on the lookout, working around the clock to find victims and the plane’s main section, Indonesian President Joko Widodo said at an evening news conference Monday at Jakarta’s airport. More than 300 rescuers have been deployed from the search-and-rescue agency, among them 30 divers who are plunging deep into the water to find the remaining fuselage and bodies. Lion Air Flight 610 lost contact with air traffic officials and fell about 13 minutes after takeoff, officials said, adding that people on a nearby tugboat watched the plane descend. Skies were clear, and there were no weather abnormalities. In a news conference, Lion Air Group’s chief executive, Edward Sirait, said the plane, a new model from Boeing, had a technical issue on a previous flight that was resolved “according to procedure.” He did not give details. Among those on board were two pilots, six flight attendants and two babies, as well as 20 employees from Indonesia’s Finance Ministry. One passenger was Italian, and the rest were Indonesian nationals. The pilot, Capt. Bhavye Suneja, was from India and had more than 6,000 flight hours, and his co-pilot had more than 5,000 hours. In New Delhi, the pilot’s grieving relatives gathered in the living room of his parents’ house on a narrow street in Mayur Vihar, a middle-class residential neighborhood in the eastern part of the city. Family members declined to speak to reporters. Many relatives had heard the news of the crash and rushed to the airport, fearing the worst. Among them was Fitri Sagala, 47, whose brother-in-law, Mangatur Sihombing, boarded Flight 610 that morning. She was at the crisis center with her sister, Mangatur’s wife. James Sianturi, 57, fought back tears as he spoke about his son, 26-year-old Jandri, who had been on his way back to Pangkal Pinang, where he worked at a bank. Jandri moved his flight to Monday morning from Sunday to spend an extra day in the city with his fiancee, who works in Jakarta. They were due to marry in May. Sutopo Purwo Nugroho, a spokesman for Indonesia’s national disaster agency, shared a video on Twitter of rescuers on tugboats looking for debris off the coast of Karawang, an area in West Java close to Jakarta. He also shared photos of mangled cellphones and a torn bag that rescuers recovered. By late Monday afternoon, rescuers had cleared debris from the water’s surface and begun diving into the sea, which has a depth of about 114 feet. Sonar scanners from naval ships have also been deployed to locate crucial wreckage, particularly the plane’s black box. Speaking at a news briefing in Bali, where he was attending a conference on oceans, Widodo urged families to remain calm while officials continue to search for life. “We are doing our best to find and save victims, and I continue to pray and hope that the victims can be found soon,” he said. The aircraft, a Boeing 737 Max 8, was purchased this year by Lion Air, Southeast Asia’s second-largest low-cost airline. The plane is one of Boeing’s newest and had flown several hundred hours since Lion Air started operating it on Aug. 15. It departed at 6:21 a.m. local time and was scheduled to arrive about 7:20 a.m. at Pangkal Pinang, the largest city on the Indonesian island of Bangka. Aircraft makers and carriers have long prized Indonesia as one of the region’s fastest-growing aviation markets, with a rising middle-class. Air travel is a necessity to dart across Indonesia’s large archipelago. Domestic passenger traffic has tripled over the past 12 years to 97 million in 2017. Lion Air controls over 50 percent of this market share, according to the Center for Aviation, an aviation market intelligence firm. But the country has long received mixed reviews on airline safety, and all its airlines were removed from the European Union’s air safety list and only in June were deemed safe to travel. Lion Air was allowed to fly in E.U. airspace in 2016. Lion Air, established in 1999, is Indonesia’s largest budget airline. It has been involved in a number of incidents in recent years but none with fatalities. One of its jets collided with a plane from another carrier, Wings Air, on the island of Sumatra last year, but no one was injured. In 2013, a Lion Air flight crashed into the sea after landing on the resort island of Bali. Several were injured, but no one was killed.